Andrea Lynn Smithburg, 52, of Lawrenceville, Georgia and formerly of Salem passed away on Friday, November 23, 2018, at the Gwinnett Medical Center in Lawrenceville, Georgia. She was born on April 1, 1966, in Mt. Pleasant the daughter of Ronnie and Marilyn Leveling Smithburg. Andrea attended Salem Grade School and graduated from Mt. Pleasant High School in the class of 1984. She attended Salem Congregational Church before she moved to Georgia. Andrea worked at the Outback Steak House in Suwanee, Georgia, where she many good friends. She always enjoyed her trips back to Iowa to spend time with family, spending time with her son and her pet dog. Andrea enjoyed going to flea markets and yard sales. 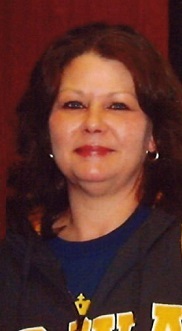 Andrea is survived by her son; Joseph Dale Smithburg of Lawrenceville, Georgia, her parents Ronnie and Marilyn Smithburg of Salem, two brothers; Brad (Michelle) Smithburg and Greg (Andrea) Smithburg all of Mt. Pleasant, and one sister, Rondi Smithburg of Joliet, Illinois, five nephews; Jacob, Brandon, Dylan, Gage and Grant, along with aunts, uncles and cousins. She was preceded in death by her grandparents, Edwin & Margery Leveling and Wilbur & Avis Smithburg. Funeral services will be held on Friday, November 30, 2018, at 10:30 a.m. at the Salem Congregational Church with Pastor Aaron Helterbran officiating. Burial will follow in the Salem South Cemetery. Friends may call after noon on Thursday at the Murphy Funeral Home in Mt. Pleasant where the family will be present from 5 to 7 p.m. that evening. A memorial has been established in her memory.